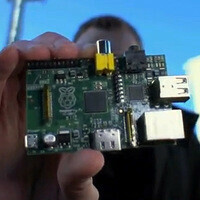 You've heard of the Raspberry Pi, haven't you? In case you aren't familiar with the cool, little gadget, it is a dirt-cheap Linux computer popular among DIY enthusiasts. Since it costs only $25, many engineering projects revolve around it, including this one for a cellular phone tower made by PA Consulting in the U.K.
And that's actually quite impressive. A GSM cell basestation is a 30-feet-tall contraption that costs quite a lot, yet a team of motivated engineers recreated its functionality using some open-source software and a Raspberry Pi. They could even send text messages and make calls over the network they created, although they had to cut the radio signal's coverage so that they don't interfere with local carriers' spectrum. So yeah, this Raspberry Pi based project is a great demonstration of how expensive cellular infrastructure can be substituted to some extent using cheap, readily available hardware. Imagine a low-power emergency phone network made using a bunch of these, or how infrastructure expansion costs could be reduced with the help of identically affordable computer modules. so they get free basic phone service with that thing? phone/sms? Is it possible to create a network of these for a small village, assuming that we have access to the spectrum?